Two-dimensional separations are a promising way to provide the increased peak capacity necessary to separate today’s complex biomedical and environmental samples. However, current two-dimensional separations are limited by the second dimension under sampling the peaks as they elute off the first dimension. One attempt to resolve this issue would be to simply sample more of the analyte peaks as they elute off the first dimension. However, as more samples are taken, the second separation must be shortened to allow for the increased number of samples, at the cost of separation efficiency. 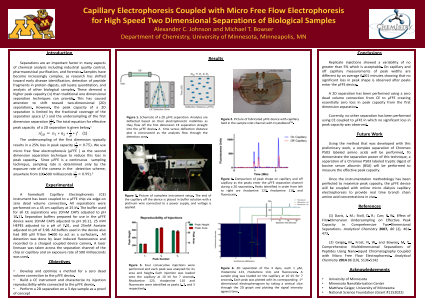 We propose using micro free flow electrophoresis (µFFE) as a solution to the under sampling problem. In µFFE analyte is continuously injected through a planar separation channel while an electric field is applied perpendicularly. The analytes are then deflected based on their electrophoretic mobilities. Since µFFE is a continuous separation technique, complicated injection interfacing is eliminated while maximizing the sampling of peaks as they elute off the first dimension separation retaining peak capacity. In µFFE, the effective sampling rate is only limited by the exposure rate of the camera (typically 100 msec). To showcase the promising separation ability of µFFE as a second dimensional technique, capillary electrophoresis (CE) will be coupled to µFFE to separate a tryptic digest of bovine serum albumin. Peak capacities greater than 3000 in less than 15 minutes are expected. This work was supported by NSF-CHE Grant #1152022. Summary: We propose using micro free flow electrophoresis (µFFE) as a solution to the under sampling problem.References: (1) Davis, J. M.; Stoll, D. R.; Carr, P. W., Effect of First-Dimension Undersampling on Effective Peak Capacity in Comprehensive Two-Dimensional Separations. Analytical Chemistry 2007, 80 (2), 461-473.